The ability to monitor respiratory rate, one of the vital signs, is extremely important for medical treatment, healthcare and fitness sectors. In many situations, mobile methods, which allow users to undertake every day activities, are required. However, current monitoring systems can be obtrusive, requiring users to wear respiration belts or nasal probes. Alternatively, contactless digital image sensor based remote-photoplethysmography (PPG) can be used. However, remote PPG requires an ambient source of light, and does not work properly in dark places or under varying lighting conditions. Recent advances in thermographic systems have shrunk their size, weight and cost, to the point where it is possible to create smart-phone based respiration rate monitoring devices that are not affected by lighting conditions. However, mobile thermal imaging is challenged in scenes with high thermal dynamic ranges (e.g. due to the different environmental temperature distributions indoors and outdoors). This challenge is further amplified by general problems such as motion artifacts and low spatial resolution, leading to unreliable breathing signals. 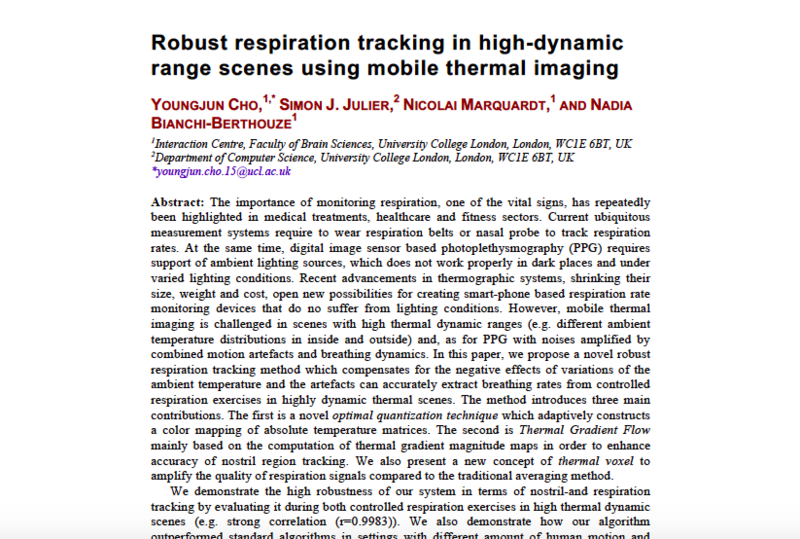 In this paper, we propose a novel and robust approach for respiration tracking which compensates for the negative effects of variations in the ambient temperature and motion artifacts and can accurately extract breathing rates in highly dynamic thermal scenes. The approach is based on tracking the nostril of the user and using local temperature variations to infer inhalation and exhalation cycles. It has three main contributions. The first is a novel Optimal Quantization technique which adaptively constructs a color mapping of absolute temperature to improve segmentation, classification and tracking. The second is the Thermal Gradient Flow method that computes thermal gradient magnitude maps to enhance accuracy of the nostril region tracking. Finally, we introduce the Thermal Voxel method to increase the reliability of the captured respiration signals compared to the traditional averaging method. We demonstrate the extreme robustness of our system to track the nostril-region and measure the respiratory rate by evaluating it during controlled respiration exercises in high thermal dynamic scenes (e.g. strong correlation (r=0.9987) with the ground truth from respiration-belt sensor). We also demonstrate how our algorithm outperformed standard algorithms in settings with different amount of environmental thermal changes and human motion. We open the tracked ROI sequences of the datasets collected for these studies (i.e. under both controlled and unconstrained real-world settings) to the community to foster work in this area.